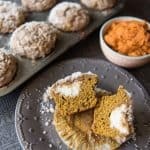 These Pumpkin Streusel Muffins with Cream Cheese Filling are sugar and spice and everything nice and then some. They are soft and rich and filled with a delightful cream cheese center - perfect for a Fall morning! In a medium bowl, combine the cream cheese and powdered sugar and mix until smooth using an electric mixer. Using a small spoon, drop 12 mounds of the cream cheese mixture onto a cookie sheet lined with plastic wrap sprayed with cooking spray. Set in the freezer for 30-60 minutes until slightly firm. When firm, cut each mound in half. Heat oven to 350 degrees. Line the cups in a muffin pan with paper liners. In a medium bowl, combine the flour, cinnamon, nutmeg, cloves, ginger, allspice, baking soda, and salt, then whisk together. In a separate bowl, combine the eggs, sugar, pumpkin puree and oil and whisk together. Stir the dry ingredients into the wet ingredients, mixing just until combined. For the streusel topping, combine the sugars, flour and cinnamon in a small bowl. Use a pastry cutter to cut the cold butter into the sugar & flour until the mixture is coarse and crumbly. Set aside. Fill each muffin cup with 1 to 2 tablespoons of batter. Place one of the cream cheese balls into each muffin cup. Divide the remaining batter among the muffin cups, covering the cream cheese completely. Top each muffin with the sreusel mixture. Bake the muffins for 20-25 minutes, then cool completely before serving.